Your roof is an investment that keeps yourself and your property safe from the weather, so maintaining your roof to keep it lasting through the seasons is an important part of the upkeep your home. You can keep an eye on your roof and guttering from the ground, and even from your armchair. Watch out for damp patches on your ceilings or broken bits of slate tiles on the floor around your home. These are sure signs that there’s something wrong with your roof. You can give your rooftop the once-over using binoculars from the ground, just to check that everything is sound and there’s no obvious sign of roof damage. If you’re competent at working at height, not afraid of a bit of DIY and have the right equipment, you can carry out small repairs or check damage from your rooftop. Remember, your roof is not meant to withstand lots of traffic so try to minimize the number of times that you walk across your roof. 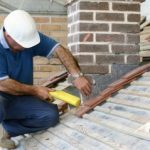 If you’re in any doubts about your ability to undertake repairs to your roof or you’re not sure what kind of damage you’re looking for, you can contact a professional roofing firm that will carry out roof repairs and can even give you a roof report so you know exactly what condition your roof is in. The easiest way to keep your roof functioning as it should it to clear it of debris. Keeping debris off your roof is important because leaves can not only clog up your guttering system, they can also decompose and allow seeds to take root. You can clear the leaves and debris by using a leaf blower or a long rake. You may be able to buy a roof rake especially for the job. You can wash your roof down with water, although be careful not to use a pressure washer as you may cause damage to the shingles. If you live in a particularly leafy area, trimming overhanging branches can go a long way towards protecting your roof and may stop small animals such as squirrels from nesting there. If moss has grown on your roof, it could be a sign of that the roof’s decayed underneath. Moss can lead to big problems with your roof if left unattended. Moss is bad for all types of roofing. It can crack cement or tiles, moisten shingles making them susceptible to damage in freezing weather, and keep wood moist so that the rot sets in. Combat this problem by using a specialist roof moss killer. Apply this in the autumn and in spring, use a broom to sweep away the dead moss. You should aim to clean your gutters at least once a year, preferably twice. If you clean your gutters annually, you should do this in autumn, before winter sets in so that your gutters are allowing water to drain freely from the rooftop. You can clean gutters yourself by simply scooping out leaves and debris that collect in areas such as the downpipes. Fitting a mesh guard will ensure that rubbish doesn’t collect in these areas and keep it clean in the future. For a more thorough clean, you should contract a roofing firm, which will use the correct equipment and clear the guttering all around your property safely, replacing downpipes or repairing leaking gutters accordingly. If you spot any leaks, you must find the source of the water and fix it fast, before water damage becomes a problem to the structure of your property. Missing slates or shingles can be replaced using roof cement. If nails have worked themselves loose, you can secure them again by hammering back into place. You can seal worn flashings around chimneys and skylights with professional sealant that will ensure that your flashings remain waterproof. Check that the chimney cap has been fitted properly and you’ll avoid water leaking problems. These are easy faults to rectify with the right equipment and a little DIY nous. If you’re not sure what you’re doing or if your roof needs extensive work, contact a professional roofer. That way, you’ll be sure to have repairs that will last for many years while you can keep your feet safely on the ground. Contact G&A Roof Repairs, the qualified roofing team, for affordable roof maintenance work on 0800 626430.